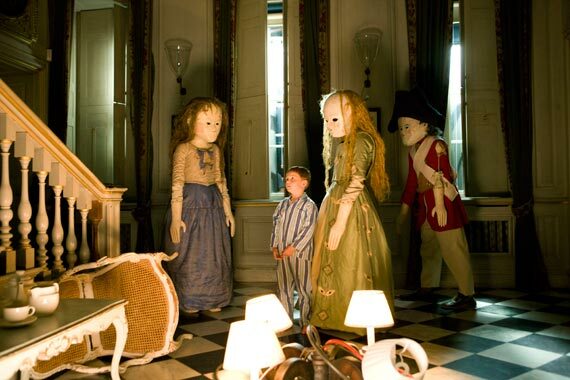 Night Terrors was an enjoyable, 99 percent stand-alone, episode of Doctor Who written by Mark Gattis. We were first led to believe it was about a boy who feared monsters in his closet. We ultimately found that the monsters were real and that it wasn’t Narnia in his cupboard. It turned out that the most important fears were not really of the monsters but a child’s fear (even if the child wasn’t human) of being rejected. I have one complaint about the episode. Although it seemed to deal with problems George had his entire life, everything major happened one night. This included getting the distress call to the Doctor to save him from the monsters to George making people in his apartment complex, along with the visitors from the TARDIS, all disappear. There was no indication that he did this to people he feared before this night. Gattis should have worked in some reason to claim that George’s powers were stronger that night to explain these things. This season’s arc is even more remarkable as River Song’s story goes back to well before this season. Viewing Let’s Kill Hitler suggested that, while Steven Moffat may have had a general idea for River Song’s story, he hadn’t planned it all out ahead of time. If he had, it would have only made sense to have such a good friend of Amy’s be seen in previous episodes. Some idea of how the storyline came about can be seen in Maureen Ryan’s interview of Steven Moffat. Reading the full interview it is obvious that it occurred before Let’s Hill Hitler. I’m interested in the conception of the River Song story. In ‘Silence in the Library,’ did you already know she was going to be the daughter of a companion? Oh no, no. I mean, it was one possible theory. Why is it somebody who’s got such connections, who would that be? Is it just a future companion? What if it’s somebody’s got a lifelong commitment to the Doctor or his companion? So when I introduced Amy, I kept my options open [and used the name Pond]. I thought I was doing [the name thing] in plain sight and nobody [caught] it for a long while. But I didn’t know at the time Karen was going to stay long enough for that story to come off. I didn’t know if Alex would keep coming back. So Plan A held, but there were other ones, including the [Plan B] that maybe River never came back at all and you could just imagine that she knows the 59th Doctor in the far future. Actually I, and I’m sure many others, were suspicious of a connection between the names Pond and River for quite a while, and there was considerable speculation that River was Amy’s daughter before this was confirmed. With River Song and her meeting the Doctor “backwards,” is that important to the character? Is that something that needs to be explained? When she says that, she’s being poetic, to some degree. The broad sweep of how she meets the Doctor is out of sequence. It’s not necessarily always exactly out of sequence. It’s been taken to mean, by some people, but that every time they meet, it’s the exact reverse. We already know that’s not true. And we’ve seen it not be true. Will we ever know why that was the case? Does it matter for her character? Why should we always meet people in the right order? I don’t know, it might help time-travel dummies like me. But who says you would [meet people that way]? It’s actually highly improbable that if you traveled around in time — why would you meet people in the right order? What law, what ticking clock is making that [happen]? I’ve been suspecting that Russell T. Davies pitched the general idea of Torchwood: Miracle Day and was given ten episodes before he had any idea as to how he would fill this many episodes. Some episodes felt like they were just filler. Even this week’s episode, The Gathering, seemed to be killing time when they had the authorities search Gwen’s home not once, but twice. It would have been better to limit to one search, and spend more time showing events which were limited to discussion this episode. I am having difficulty figuring out the motivation here for such aggressive action against Category 1 individuals. I can see the justification (ignoring the moral issues) of burning them if they are using up limited hospital facilities, but it wouldn’t be worth extensive police resources to hunt out people kept at home. It would be different if they knew that Gwen was robbing pharmacies for supplies, but they clearly have no suspicion of that. The episode did show a move towards despotism. Rather than searching out Category 1 individuals, I would suspect that instead we would be seeing forced sterilizations to offset the population growth from the near-absence of death. An even bigger complaint about how the series has been playing out has been that the Torchwood team might some discoveries, such as about the stock pile of pain medications and what was happening in the camps, but the really important clues seem to just occur. The episode ended giving the appearance that Jack and Gwen might find the Blessing not due to their own detective work but from a drop of Jack’s blood showing the way. Plus we learned that it is possible to dig all the way to China. It is not known if Torchwood will return for any future seasons, but there is hope now that Starz and the BBC have entered into a multi-year agreement. Leftist criticism of Obama has been a hot topic in the blogosphere this holiday weekend, including a number of rather illogical responses to Jonathan Chait’s article in the New York Times Magazine which I discussed here. One of the most absurd posts came from Matt Stoller at Salon, suggesting a primary challenge to Obama from the left, even at the cost of losing the general election. Stoller’s view of politics and history was just too absurd for most people to spend their holiday weekend responding, but James Joyner wound up doing so, making it unnecessary for the rest of us. Joyner appears to see through the fantasies common on the extremes of both ends of the political spectrum. Although he responds from the right, his discussion was based upon a common sense and understanding of basic politics which transcends any ideological differences. FDL’s Blue Texan points out that several liberal economics luminaries–Paul Krugman, Dean Baker, Brad DeLong, and others–argued for a much larger stimulus. But passing the $787 billion version required the Democrats to go to the mats, barely peeling off enough Republican votes to avoid a Senate filibuster. And doing that fired up the Tea Party and directly led to the historic 2010 thumping that Stoller blames on Obama being insufficiently progressive. Krugman and I were on the same side of the bank bailout issue and for similar reasons. But we were extreme outliers. Most economists were warning of dire consequences if we allowed the banks to collapse. As it was, the Bush administration’s decision to let Lehman Brothers go under is cited by many as ground zero in the global financial collapse. Similarly, Krugman and I were outliers on the stimulus, with him arguing for one wildly larger than there was political support for and me arguing for a much smaller one targeted at those who lost their jobs and houses because of the meltdown. Frankly, either of those would likely have been better than the expensive but futile mishmash we got. But nobody made either of us king and we therefore got to live with the political realities rather than our fantasy world. By any reasonable standpoint, Obama has been a fairly centrist president. One can make the case that his “lead from behind” style has made him a weak president but one can also make the opposite case–that he’s passed a massive stimulus, a historic reorganization of the health care system, and took us to a war that had very little political support through working the system from behind the scenes. Pointing out that Obama has been a centrist will not endear him to portions of the left-blogosphere who are foolish enough to believe that someone to the left of Obama would have a chance of winning, or that any president would really have had the ability to have pursued an even more liberal course. I also pointed out the many liberal successes of the Obama presidency (see here and here), which some on the far left choose to ignore. A view of the alternative can be seen here.